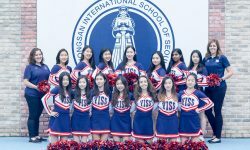 The YISS Varsity Cheer team had a great season winning 3rd place at the KAIAC Cheer Competition. They also won “Best Dance” for their competition routine. The team was led by returning Senior, Lisa Rhee who has cheered all four years of her high school career and been Captain for three of those years. Emily Birmingham, returning Junior and also team Captain was named to the All-Star KAIAC Cheer team. This team pulled together and worked hard throughout the year to plan the school pep rallies along with cheering at games and building school spirit. Their commitment to excellence showed in every new routine and performance. The junior leadership of Aeri Kong, Jennifer Kim, and Sunny Chung contributed strong athleticism and creativity to a team that was marked by crowd-pleasing routines and exciting stunting. Rounding out the team were Sophomores Jessica Byun, Suyoung Yang, Judy Chung, and Ashley Lee who added great enthusiasm and spirit. Way to represent Lady Guardians!! !